Happy Hump Day everyone! Congratulations - the weekend is officially in sight! When cooking for a crowd I like to keep it simple but also pack a punch with flavors. I also like to serve things family style, as you can see below. I didn't realize till I sat down that my artsy blog shot had been photo bombed by my family friend's 3 1/2 year old's lunch and sippy cup. I think it adds a little something extra don't you? Anyway, for lunch I made my favorite roasted butternut squash soup (always good to have something to warm people up when they come in form the cold!). This soup combines butternut squash, apples, and shallots with the heat of curry. It is a spectacular dish that can warm you up on a cold day. 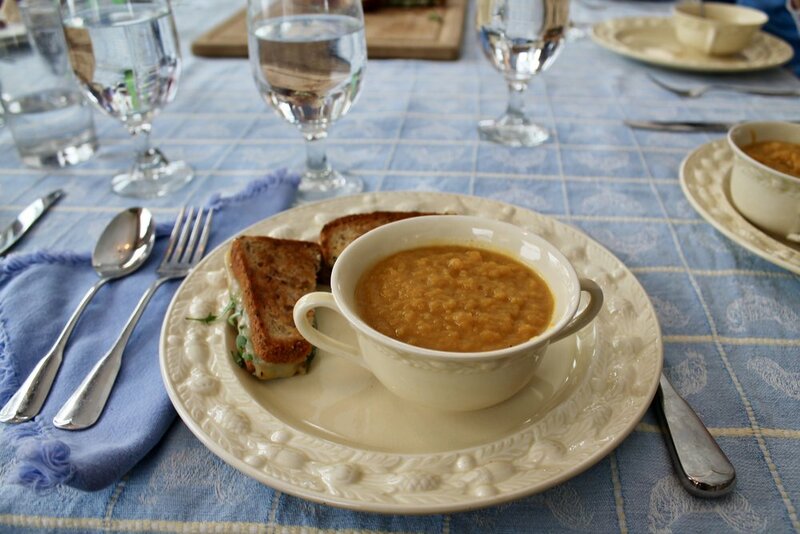 I paired the soup with, munster grilled cheeses with fox hollow mustard and arugula. I wanted to jazz up my grilled cheese, so I added the mustard (fox hollow is a balsamic vinegar and molasses based mustard - honestly its like my crack) and arugula. But lets be honest the key to perfect grilled cheese is BUTTER and lots of it. I wanted to add a peppery bite to cut through the sweetness of the butternut squash and the mustard. Now not trying to toot my own horn but it was pretty tasty not going to lie. My mom always serves our lunches family style like this - with a large platter of sandwiches where you are able to grab what you want. There is much less waste this way, because you grab however many slices you actually want, be it a half or a whole sandwich. The soup can easily be made in advance and reheated day of. The grilled cheeses can also be banged out pretty quickly especially if you have a large skillet (like the ones for pancakes). What are a few of your favorite ways to feed a crowd? Let me know in the comments! Preheat the oven to 425 degrees. Peel and roughly chop the apples, shallots, and butternut squash into 1 inch cubes. Toss with olive oil, salt, and pepper. Spread them out on two baking sheets. Roast for 30 minutes until tender (a fork should come in and out easily). In a soup pot over medium heat add the butter, once melted add the curry powder. Stir the curry butter mixture, this will allow the curry to bloom and develop a rich flavor. After about 5 minutes add the stock and bring to a simmer. Meanwhile heat the stock on the stove to a simmer. Once the squash is tender transfer it to either: A. your blender puree until smooth adding some of the stock to help it grind up. (be careful it will be very hot) OR B. put the roasted veggies and apples in the pot with the stock and use an immersion blender to puree until smooth. Bring the soup to a simmer and allow everything to get to know each other over low heat for approx. 20 minutes. Serve and enjoy! Note: To make things easier, feel free to roast the squash, apples, and shallots a day or 2 before. The day of puree them with the hot stock to cut down on prep time.